In light of the crowdedness at MRT stations during rush hours and likely inconvenience for passengers such as families with strollers and pregnant women, Taipei Rapid Transit Corporation (TRTC) is pilot-testing the concept of priority queuing areas for expectant moms and families at selected locations along the Tamsui-Xinyi (Red) Line and Songshan-Xindian (Green) Line. Working in coordination with designated family-friendly carriages, the priority queuing zone is located at the area corresponding to the third and fourth carriage of MRT trains. 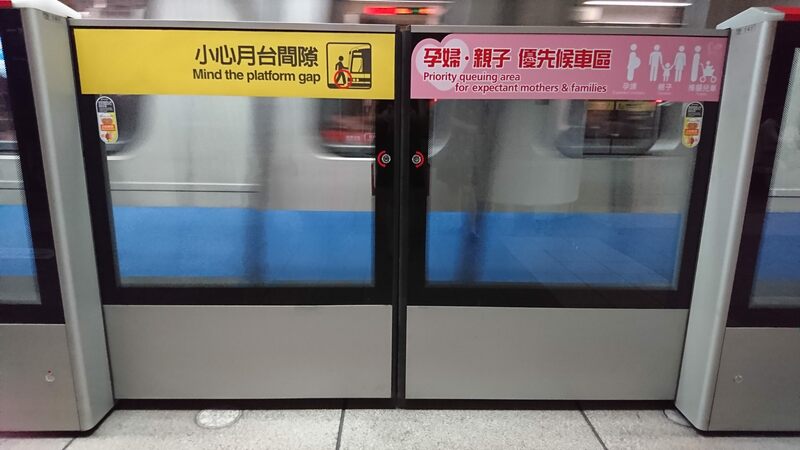 The corresponding platform areas are marked with pink-color stickers on the gates identifying the area as the priority queuing for families and pregnant women. The family-friendly carriages can be found along trains serving the aforementioned lines, which see a high volume of parents and kids traveling to travel destinations during weekends and holidays. Some of the carriages are currently decorated with “under the sea” themes featuring whales, sea turtles, jelly fish, octopus, starfish, and other creatures of the ocean. TRTC also reminds women expecting babies to pick up free ‘pregnant women’ stickers at the information counter across all MRT stations. The company suggests that the sticker can be placed on hand bags or ID tags for repeated use.